Hundreds gathered on the streets of Tottenham, North London, after the police killed local man, Mark Duggan. Barricades were set up and police cars burned as the protests ran long into the night. On Saturday afternoon, friends and family of Mark Duggan, the 29 year old man shot and killed by the police on Thursday, marched from his home in Broadwater Farm estate to Tottenham police station. They waited for someone to come out from the police station and hear their concerns, and give answers about Mark's death, but they were ignored. As the evening continued, reports and photos came through, as about 300-500 people from across the community gathered on Tottenham High Road, and pictures of two police cars set on fire with petrol bombs filtered through to the mainstream media. Chants of "Whose streets? Our streets!" and "We want answers!" could be heard from the crowd. A protester from the original march from Broadwater Farm interviewed on BBC News said the police attacked a 16-year old woman with batons without provocation, sparking a response from the crowd who up to that point had been chanting outside the police station. Video footage of the police assault has been posted here. Eye witness reports described police "running and hiding" as they were unable to contain the crowds, who had built barricades and were charging police lines, using makeshift missiles and burning wheelie bins to keep the police away. A stand-off seemed to happen for some time, as police and protesters formed lines, before a double decker bus was set on fire. 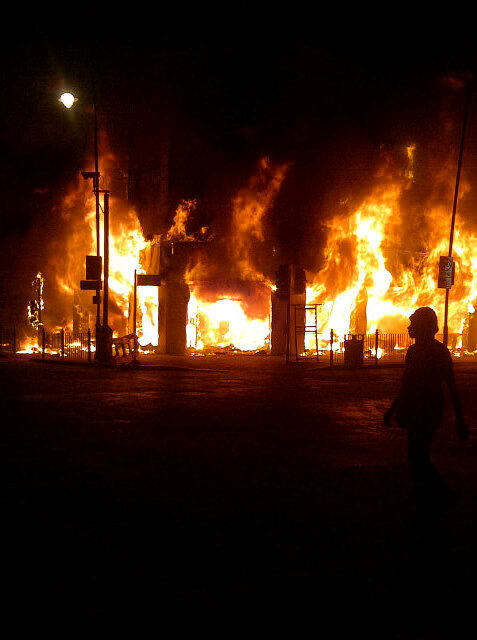 There have been widespread reports of looting and fires being set, including in the local job centre. By 2.30am, there are now reports on Twitter of rioting spreading into Wood Green, Turnpike Lane, and Green Lanes, as the police are trying to break up crowds on Tottenham High Road. There have been reports of Tottenham Hale retail park being looted, including JJB Sports and PC World. "These are our ends, we're here to tell the police they can't abuse us, harass us. We won't put up with it, this is just the beginning, this is war, and this is what you get - fire." The BBC broadcast live footage of young people smashing the windows of an empty police car, and then asked protesters why they were trying to block the camera crew from filming. Both Sky News and BBC withdrew their camera crews from the scene as crews were challenged and attacked. BBC and Sky have quoted the local MP, David Lammy, claiming that the people on the street are not representative of the majority of Tottenham residents. However, their own live footage showed local people from a wide range of ethnic backgrounds standing together and forming lines against the police. The police have been insisting that the events are 'localised' and are not spreading beyond Tottenham, eye witness accounts are disputing this, and the mainstream media have been effectively shut out of the area. Tottenham saw major riots in 1985 in response to the death of Cynthia Jarrett at the hands of the police. Tottenham has also been hit by recent government austerity measures, with several youth centres being closed in recent weeks. Thread on the forums here! Idiotic article by Toby Young in The Telegraph, but it's nice to see idiots being profoundly depressed by this. #tottenham riots and looting has spread to Wood Green. Over 30 shops smashed and looted, including T mobile, Carphone Warehouse, Orange etc. Utter anarchy in #woodgreen. People with armfuls of goods. I'm going to bed. #woodgreen is being ransacked. Guy smashed in betting shop smoking a fag. Still no police. Buses refusing to go down #woodgreen high st. Bystanders attacked. Carphone Warehouse smoking. Round corner- I am watching four youths breaking into Lidl with dogs. BBC cuts from #tottenham riots to "olympic dreams" Turns out we have great gold medal hopes in the 100 meter petrol bomb event. I've heard reports that people have been made homless due to the fires. Can anyone confirm this? Auto - BBC are saying at least one family's home was burned out. Window shopping, Wood Green: Everything Must Go! (I love the comment by the first - and only, so far - poster after all those photos). There were houses above quite a few of the shops. Tottenham hale was smashed up, not sure if it was looted but I'd be surprised if it wasn't. Reports coming in of 'disturbances' in Enfield. Apparently people are putting concrete slabs through shop windows. Riot vans are trying to cordon off the area. Guardian's reporting that the bullet lodged in the policeman's radio - which they said had been fired by Duggan - has turned out to be police issue. There's something very dodgy about this whole situation... and it's not going to help the mood on the streets. That's not a surprise about the bullet. Where in Enfield? Edmonton shopping centre? This fits with the other bit of news - Apparently Channel 4 reported that the gun supposedly belonging to Duggan was not fired. Iirc the police only said three shots were fired and one was lodged in a police radio, but it was the 'independent' IPCC that joined the dots into the 'Duggan fired first' narrative, before even investigating. I want police to be injured by wooden dildos, as a satire inverting the brutal use of their baton. I would be extremely surprised ....... What an absurd thing to say! Very absurd - but I'd be surprised if the cops didn't use these riots as a bargaining ploy to stop the budget cuts (for the cops only, of course). Makes it clear - if you didn't already know it - how pathetic the "we support you too" cry from anti-cut protesters to the cops has been. But I bet those sad liberals will continue crying it regardless of how many people cops kill.